The MPU-6050 is the world’s first integrated 9-axis Motion Tracking device that combines a 3-axis MEMS gyroscope, 3-axis MEMS accelerometer, and a Digital Motion Processor (DMP). With its dedicated I2C sensor bus, it directly accepts inputs from an external 3-axis compass to provide a complete 9-aixs output. 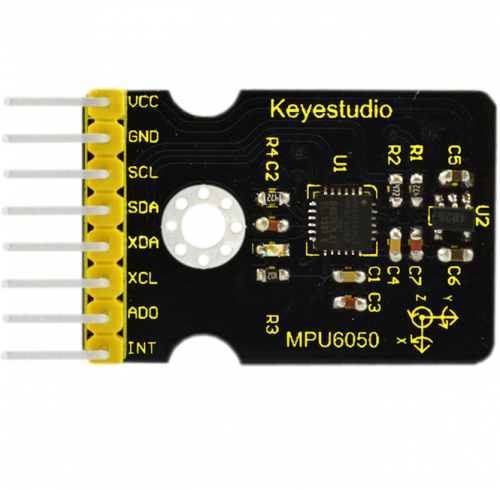 The MPU-6050 is also designed to interface with multiple non-inertial digital sensors, such as pressure sensors. The MPU-6050 features three 16-bit analog-to-digital converters (ADCs) for digitizing the gyroscope outputs and three 16-bit ADCs for digitizing the accelerometer outputs. For precision tracking of both fast and slow motions, the parts feature a user-programmable gyroscope full-scale range of±250, ±500, ±1000, and ±2000°/sec (dps) and a user-programmable acceleration full-scale range of ±2g, ±4g, ±8g, and ±16g.